R seems to be able to output nice summary plots from the bugs and jags objects generated by the functions R2WinBUGS::bugs and R2jags:jags. However, I am using the rjags package. When I try to plot the results of the function rjags::coda.samples using R2WinBUGS::plot.mcmc.list the results are diagnostic plots (parameter density, chain time series, autocorrelation) for each parameter. Below is the type of plot that I would like to produce, from Andrew Gelman's tutorial "Running WinBuugs and OpenBugs from R". These were produced by using the plot.pugs. The problem is that plot.bugs takes a bugs object as an argument, while plot.mcmc.list takes the output of coda.samples. Function converting results from Markov chain simulations, that might not be from BUGS, to bugs object. 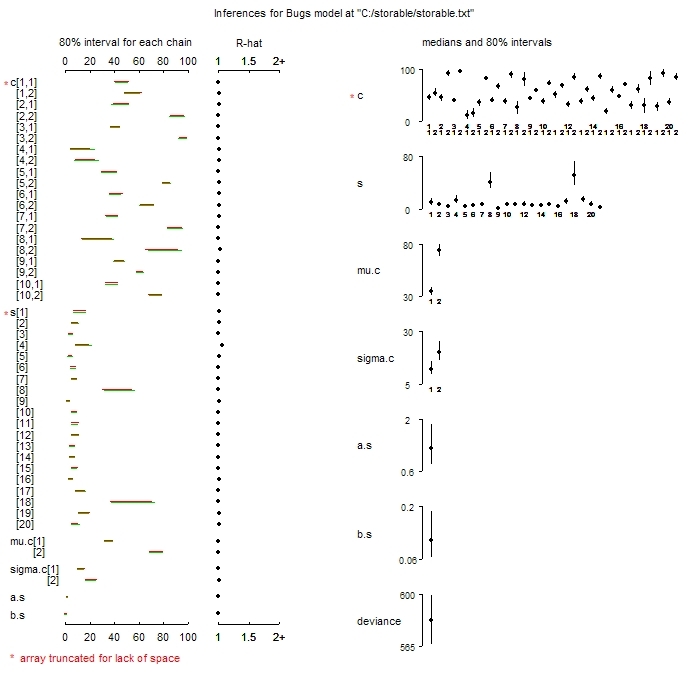 Used mainly to display results with plot.bugs. It will take a little bit more work to determine the correct way to transform the LINE.out, and the LINE.samples object from example(jags.samples) may be an easier place to start. Not the answer you're looking for? Browse other questions tagged r data-visualization jags bugs or ask your own question. How does dinterval() for interval censored data work in JAGS? How do I specify priors for angle parameters in BUGS/JAGS? How do I correctly produce a prior/posterior plot from MCMC chains in Bayesian hierarchical models? Theoretical ground which forbids the use of Frequentist SAR specifications in Bayesian estimations?